You might remember that I recently went along to the Yayoi Kusama retrospective at the Tate Modern and was left a bit non-plussed by it all. Well, last night, Frances Morris, Head of Collections (International Art) at Tate and former Head of Displays at Tate Modern, spoke at the Japan Foundation about curating the Yayoi Kusama retrospective at the Tate Modern, and I decided to see if she could make me any more interested. For Morris, there are two ways in which an exhibition can come about – one is as a culmination of intense study and interest, the other is as a result of insatiable curiosity. In the case of this Kusama retrospective, it was the latter that drove Morris to travel more than she ever has for any other exhibition she has curated, and meet with the “extraordinary, amazing, really freaky” Yayoi Kusama on a number of occasions in Japan. It was clear from the way she spoke about her experience of curating the exhibition that it was an incredible yet exhausting experience, and she seemed quite glad that it was over and she could move on to something with less pressure. 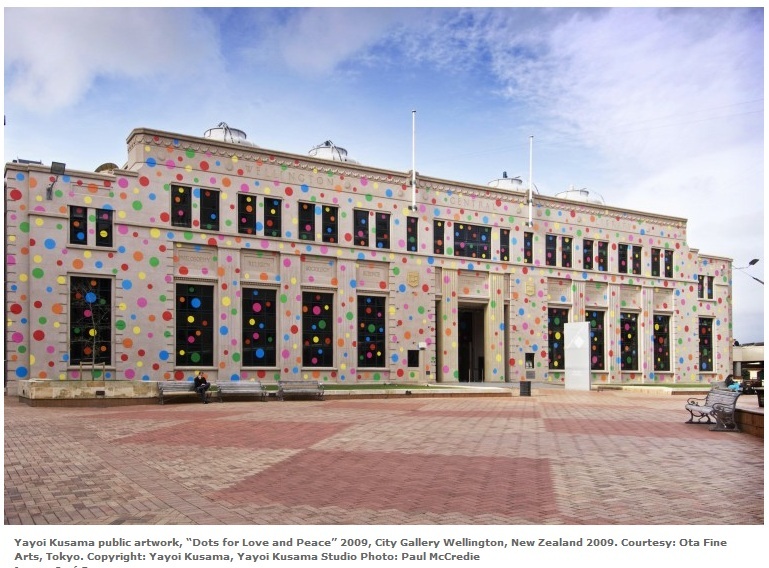 The first step on the Kusama path for Morris was a trip to the City Gallery in Wellington, New Zealand. There, she took notes and began to think about how Kusama’s work should be represented in London. One thing she noted in New Zealand were the massive queues and she felt certain that, whatever she did at the Tate Modern, she wanted to avoid queues like that. Most of the queuing was because of the small mirrored rooms which drew huge crowds. Morris, believing in the importance of collaboration between the curator and the artist, asked Kusama what she thought the solution would be. Kusama’s response: “I’ll make a bigger one!” And they did (Infinity Mirrored Room) with a walk-through, which somewhat eased the crowds at the incredibly popular exhibition (although not enough, in my opinion). Naoshima – I have to go there one day! I’m still of the opinion that a lot of Kusama’s work is mostly not for me. I can’t get to grips with the childlike paintings or the white Infinity Net paintings, but I do quite like the sculptures. Morris’s talk did, however, make me a lot more interested in Kusama as a person and as an artist, and I’m quite tempted to read her autobiography now. 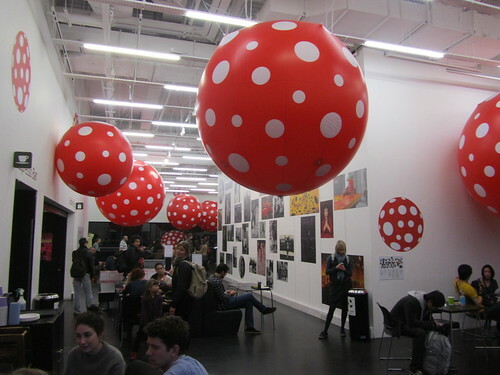 The Yayoi Kusama retrospective at the Tate Modern in London is open until 5 June. It will then tour to the Whitney in New York in July. Apparently Kusama is also going to “go viral” (Morris’s words, not mine) on 10th July, when she takes over the windows of every(?!) Louis Vuitton store in her new collaboration with the famous designer brand. Watch this space for more news on that! I’ve long been a fan of her work. I only went because I love the pumpkins! 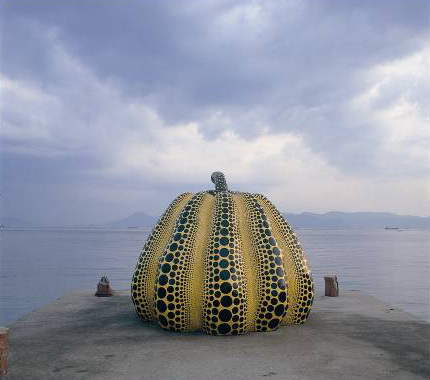 I love the crazy dotting done by Yayoi Kusama, and I’ve been to Naoshima to see the pumpkins myself. A few years ago in Singapore, we had all the trees along a popular shopping strip covered in red & white polka dots which was a delight to see!